Over 2,000 people were interviewed for this survey on the death penalty in in four districts of Tajikistan. 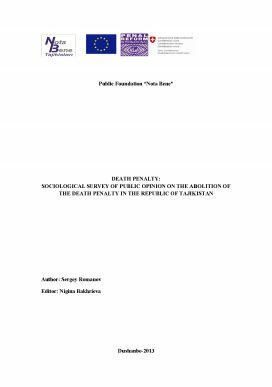 The survey was carried out by the NGO, Nota Bene, in 2013, funded by a small grants programme run as part of PRI’s EU-funded programme on the progressive abolition of the death penalty. support for the abolition of the death penalty had increased by 6% since a similar survey in 2010 to 67.2%. the rural population mostly supported abolition of the death penalty, whereas the majority of the urban population supported retaining it. representatives of the prosecution and investigation agencies largely support the retention of the death penalty, while judges believe the death penalty should be abolished.